Calais lace actually has its origins in the English city of Nottingham. One might have expected Flemish hand-made lace to have had an influence. After all, Bruges, the “Venice of the North”, is only about 100 km away... But Calais lace actually has its origins in the English city of Nottingham. In 1816, some workers from the city smuggled in the first lace making machines and set up shop in the Saint Pierre quarter. Over the course of the 19th century, the village became a town and the small business became a flourishing industry. Large numbers of Britons settled in Calais, because it was at this time that regular sea crossings began. Many of these people started families and put down roots in Calais - and the traditional English Christmas Pudding is still alive and well here. Machine-made lace may have originated in England, but a French touch was added when adjustments were made to the machinery which the engineer Joseph-Marie Jacquard had invented for the silk industry. It is no coincidence, therefore, that the main street in the Saint Pierre quarter bears the engineer’s name and that a statue of him stands opposite Calais theatre. The arrival and subsequent growth of the lace industry caused major upheavals in what was then the town of Saint Pierre. Just imagine! At the beginning of the 19th century, before the first lace making machines arrived, Saint Pierre was a little town of 3,000 inhabitants. 70 years later, in 1885, when it merged with the port of Calais, Saint Pierre had become a city of 33,000 inhabitants! That gives some idea of the rapid urban development needed to cater for this growth... Place Crèvecoeur and the theatre are just two examples of the major changes of the period. To get an impression of what the Saint Pierre quarter was like, you can also venture into the side streets off the main thoroughfares. There you can see elegant townhouses, remarkable façades, workers’ houses and old workshops - all reminders of a time when about 20,000 people worked in jobs related to the lace industry! The bow-windows of the façades around the theatre are a further example of the English influence. Another industry from England...for children and grandchildren! But lace is not the only activity to reach Calais from England. 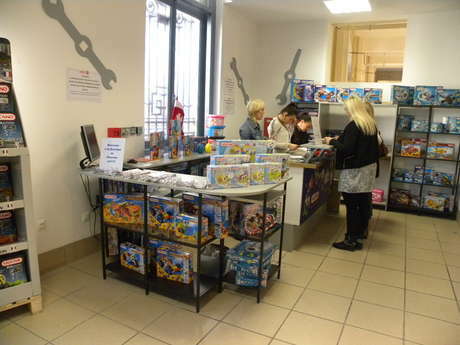 In the Boulevard Jacquart, you’ll find the “Meccano Lab”, a showcase for the world famous toy. Although it was invented many years ago in Liverpool, most of its kits have, for decades, been made in its Calais factory.